Academic pricing is shown. For-profit institutions should contact TopoGEN directly for a quote. DNA Repair pathways in animal cells can be divided into two main categories: HR and NHEJ. HR or homologous recombination is a minor pathway but very important in protecting cells from genotoxicity. HR needs a homologous sequence and is limited to S-phase. A specific reporter based assay for HR can be very beneficial for drug discovery projects, learning more about the process of DNA HR repair and establishing intersecting pathways and druggable pathway targets. This is the first HR reporter that has been engineered into a neuronally derived mouse cell line model. The CN1.4 cell line is a clone derived from mouse embryonic day 13 neuronal cultures. The line was transformed using the temperature-sensitive SV-40 Large T-antigen. The cell line expresses numerous neuronal markers, including neurofilaments, glutamic acid decarboxylase 67, neuron-specific enolase, and the BG21 isoform of the myelin basic protein gene. Due to the presence of the temperature-sensitive T-antigen, the cells are cultured under normal conditions at 34oC. Under these conditions, the cells will continually divide, and some cells will show a partial differentiation phenotype, extending short neurites (J Neurosci Res.54 (3):309-19). Cells are typically cultured in DMEM supplemented with 10% FBS under normal culture conditions at 34oC. CN1.4 cells can be terminally differentiated by culturing the cells on dishes with a binding substrate (i.e. poly-D-lysine, collagen, or laminin) at 39oC. Certain neurotrophic factors, such as BDNF and IGF as well as decreasing the amount of FBS in differentiation media to 1-2%, may aid in the differentiation process, but cells will differentiate in the absence of these factors as well. Once differentiated, cells display a neuronal morphology and produce long, intricate dendritic and neuritic networks. If cultured for long periods of time, after differentiation, the dendritic network may become quite extensive and dense. The CN1.4 line represents a unique neuronal model that can be utilized to study neuronal processes and events such as neurodegeneration in a system that closely represents a primary culture, but can be maintained as a stable cell line. To date, there are few, if any, studies utilizing the CN1.4 line in investigating DNA repair mechanisms in a neuronal phenotype cell. This line would be a powerful tool to interrogate the intersection of DNA repair mechanisms and neuronal processes in a pre- and post-differentiated neuronal line. In HR (sometimes referred to as gene conversion), a donor DNA sequence with homology to both sides of the DSB supplies genetic information to repair the break. The homologous sequence is copied into the broken locus, making the repaired locus an exact copy of donor sequence, without altering the donor sequence (Fig. 1). A cell based/cell context system has been designed to allow researchers to examine and interrogate the HR process in live cells. The HR Kit uses a twin GFP cassette that converts from GFP negative to GFP positive cells using homologous recombination (HR). DNA repair via HR (as gene conversion) will result since a wild type (homologous) GFP segment is present in close proximity to the DNA break. To introduce a precise DNA cleavage, a mega-endonuclease (I-Sce1) introduces a DS break in the GFP locus of Cassette 1 (Fig. 1). It is important to note that the human genome contains no I-Sce1 sites; therefore, an I-Sce1 site in Cassette 1 means that the DS break occurs only at this precise location and not elsewhere in the genome. The DS break initiates HR and using the WT sequence as a homology template (located in Cassette 2) the gene converts to WT and GFP positive cells appear (Fig. 2). 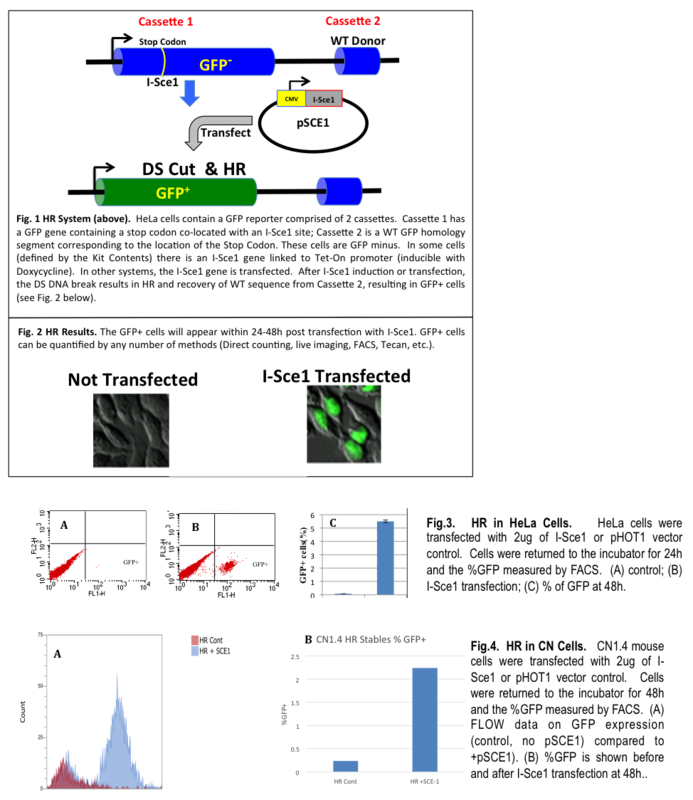 HR is triggered by a DS break which is achieved by transfecting cells with an expression plasmid for I-Sce1 (Fig. 2). HR in the HeLa cell model is shown in Fig. 3. Inducing HR in the CN1.4 cell is easily accomplished by transfection with pSCE1 and typical results are shown in Fig. 4. Typically from 2- 10% of the cells will convert to GFP+ within 48h post transfection. HR-CN1.4 Cells ready for culture in T-25 flask. I-Sce1 gene expression plasmid, pSCE1. A detailed protocol describing how to set and use this kit for assaying HR mechanisms in the cell host provided. This kit includes a reporter cell line ready for culture and is shipped at ambient temperature. The cells can be stored at 4° C for no more than one week before plating. Other reagents should be stored at 4° C (short term) or -20° C (long term) upon receipt.